sister city relationship established on 22 April 1989. 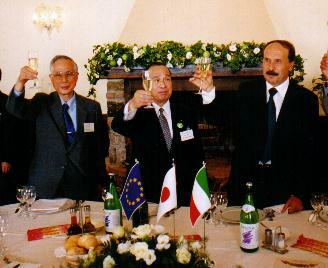 In 1983, an Italian man currently living in Saitama Ken came to Tendo to see the Ningen Shogi (Human Chess) Festival. His name is Mr Calio del Vescovo and he is a representative of Meridiana, Italy. Mr Calio del Vescovo was impressed by how similar Shogi is to Italian Chess. Every two years in Marostica, Italy, a Human Chess Festival takes place which he said was strikingly similar to that which takes place in Tendo. After visiting Tendo and watching the Shogi Festival, Mr Calio del Vescovo proposed that a Sister City Relationship should be established between Tendo and Marostica. In 1987, the Mayor of Marostica came to Tendo in order to watch the Festival. He too was impressed by how similar it was to the Festival held in Marostica. The following year a group of people from Tendo went to Marostica to watch the Italian Human Chess Festival. It was after this visit that a Sister City Relationship was officially established between Tendo and Marostica City, in 1989. Since 1989, there have been many visits to Marostica by groups and individuals from Tendo. Groups from Marostica have also visited Tendo. Every year the City of Marostica presents a trophy to various athletes and people in Tendo. Who receives the trophy varies from year to year. The City of Tendo also presents various groups and companies, from Marostica, with presents and rewards. In the Year 2000, thirty five people from Tendo visited Marostica, Italy and were able to see the Chess Festival. They were all very impressed and were very grateful for the way in which they were made to feel so at home during their stay. Many compliments were made about the wonderful Italian Cuisine.